With the adoption of Mobile Devices influencing the search landscape more and more, Google have decided to update its guidelines for Search Quality Raters. This is big news since Google used to previously to keep these 'behind closed doors', but occasionally one would escape into the wild and be dissected. Back in 2013 Google published an abridged version as they looked to “provide transparency on how Google works” after previous leaks of the document in 2008, 2011 and 2012, then in 2014. However, as the use of mobile has rocketed, the need for a “Major” revision of the guidelines was deemed a necessity. 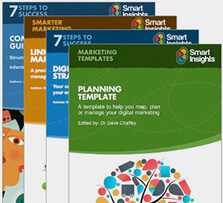 So, if you work in search we suggest you download a copy now before people change their mind. What are the Search Quality Guidelines? In short, it is a document that will help webmasters and people alike, understand what Google looks for in web pages and what it takes to top the search rankings. They work this out by using Google’s Search Quality Evaluators (third-party people hired by Google via a third-party agency to rate the search results) to measure a site’s Expertise, Authoritativeness and Trustworthiness, allowing Google to better understand what users want. Referring back to the ‘What is it?’ section, it helps you to understand better what it takes to top the search rankings. And whilst it doesn’t necessarily define the ranking algorithm, it provides you with an insight into what Google are looking for, which, as an SEO Professional, Webmaster, even Website Designer is invaluable information. If you’ve read previous incarnations (excluding those who have had a peek at the leaked 2014 version) you’ll see a completely new structure, which has been rewritten from the ground up. Looking at the monstrous contents page, it’s easy to get overwhelmed, however it’s relatively simple to follow. The first section is the General Guidelines Overview (Pages 4-6), highlighting topics such as the purpose of Search Quality rating, Browser requirements, Ad Blocking extensions, Internet Safety etc. This is followed by the Page Quality Rating Guidelines (Pages 7-65), which discusses at great detail what Page Quality entails, providing examples of High Expertise, Authority and Trustworthy pages along with the middle tier and lowest tiers. Something interesting about this section is the Your Money or Your Life (YMYL), which discusses pages that could “potentially impact the future happiness, health, or wealth of users”. The next section looks at Understanding Mobile User Needs (pages 67-86), there is a large emphasis on this part of the report as it is one of the key reasons behind the update. This Brand new section highlights the multiple issues that cause trouble on websites when viewed on a mobile device. 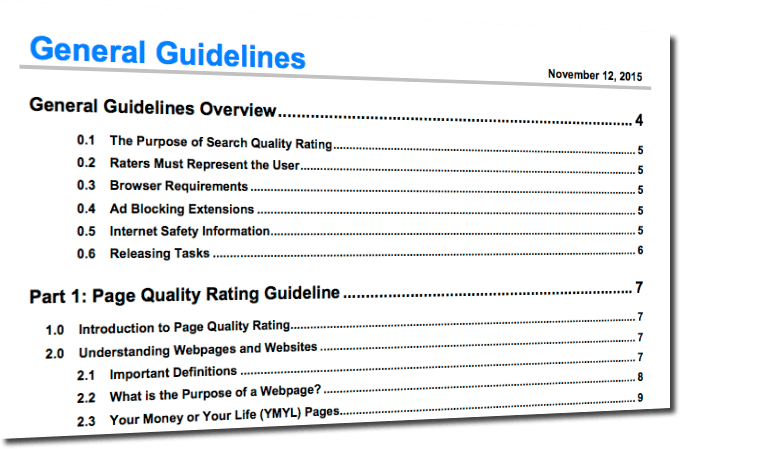 Another new section is the Needs Met Rating Guideline (87-149), which is one of the new ratings for webmasters to determine the quality of the site. It refers to mobile searcher’s needs and questions “how helpful and satisfying the result is for the mobile user?”. The final section discusses Using the Evaluation platform for the Google Search Quality Evaluators (pages 152-158). It shows the process the Evaluators had to undergo, whilst reporting to google. Here's our analysis of the sections of the parts I felt were critical to read - there's a lot, and you may think differently! The entire Mobile User Needs (pages 67-86) is worth a scan at the very least. Needs Met Rating (pages 87-149). For a more of an in-depth overview, check out Jennifer Slegg’s post at thesempost.